What we do and don’t do with your data. When you decide to store and use your favorites collection in the Cloud with www.linqto.me you are giving us data that would otherwise be on your computer, tablet or smart-phone. You may ask: what do we do with this data, where is it stored and how do we use it? TL;DR answer: nothing, we store it and help you organize it so you can access it from anywhere. Longer answer: the data you share with www.linqto.me is stored on our servers in a data-center located in the Netherlands. The servers are owned and operated by Linqto.me and only Linqto.me service members are allowed to access these servers to maintain and ensure their smooth operation. The data is stored securely in our relation database and is encrypted, so even staff that accesses the server does not have the ability to read the data from an account. The data transfer between the www.linqto.me servers and the devices (computers, tables or smart phones) with which you use to navigate the site with is also secured. The site uses TLS (Transport Layer Security) based on the TLS 1.2 protocol, to make sure that no one can peak at the data the site is sending you or you are sending the site. We do not share the data stored on our servers for your account with any third-party entities. The data is used only to allow the website to display your bookmarks and notes back to you, via the different views that are available in the system (like the My Dashboard view, where you can organize your bookmark collection based on several criteria). The only time we share bookmarks and notes with third parties is when you mark these items as being public. When you click the 'Note is publicly listed' or 'Link is publicly accessible' checkboxes, these items will become available to the Notes public index or the Bookmarks public index on the www.linqto.me website. These indexes are available to everyone and anyone who accesses the site at any given time: this includes search engines and tools used to record the state of a website at a given time. When rendering a bookmark, note or folder public, these are also made available in the Bookmarks or Notes public search feature on www.linqto.me, while the folders that you have shared publicly will be available on your profile page. The same is true for the keywords that have been used to create the bookmarks, notes or folders you have shared: they will be available on the auto-complete suggestions that the search text field offers all public users. You may want to keep in mind that once an item (bookmark, note or folder) has been made public, we cannot stop third party entities from copying it or indexing it. Even after you decide to no longer make that item public, a copy of the item may remain on the Internet and be available for consultation in search engine indexes. This is outside of our control and we cannot be held accountable for such copies or how they are used. The thing to remember is that: if your data is marked as private, which is the default setting in www.linqto.me, that data will only be available to you, delivered securely to your device. We will not access the data or share it with anyone in any circumstances! In 2018 Linqto.me has gone mobile! We have been quiet on the Linqto.me blog throughout all of 2017, but busy working in the background. The website interface has been streamlined to allow it to seamlessly adapt to three very different types of displays: computer (desktop and laptop) displays, tables and mobile phones. Having access to your bookmarks from anywhere and on any device is a necessity today. In the past www.linqto.me already allowed you to have access to your favorite bookmarks and notes from anywhere, the issues was the device you were using. As long as you were using a desktop or laptop you could easily work with the site. Some bigger screen tablets would work well, but mobile phone screens proved to be a challenge, since the site rendered too small on these devices and the controls to allow you to create / edit or simply inspect content you had created where inaccessible to touch. During all of 2017, we have worked to get the site to correctly render on all these three formats: the large size display of a computer, the medium display of a tablet and the smaller size of a phone. This included changing the way that certain controls and menus would render on the larger screens, medium tablets and small smartphone screens. We have added self-explanatory icons for menus, made sure buttons and menus were rendering big enough to allow them to be used with touch screens, as they should be. 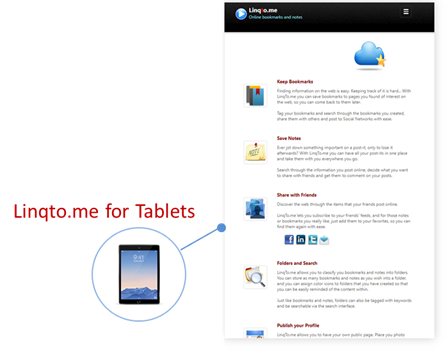 Starting with www.linqto.me version 8, you can now quickly access all your stored bookmarks on any device with ease. Just give it a try and see what our new mobile layout looks like, and www.linqto.me will also be your new bookmark and notes manager on the phone and tablet. Having favorites in the Cloud with www.linqto.me is useful, and can help you organize and maintain your collection of bookmarks as well as access them easier as you can read here. But you also need a way to easily add bookmarks while you are navigating around the web at the click of the button, without moving away from the page you are on. 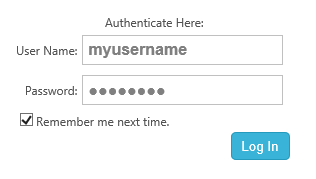 After creating your account with www.linqto.me, head over to the Tools page of your private space on the site. On this page you will be able to find the Bookmarklet tool – this is a piece of automation that you can add to your browser that will allow you to save bookmarks directly from the page you are on without having to open www.linqto.me in another tab. Locate the 'Bookmarklet' button and drag and drop the button to the favorites bar of your browser as shown in the screenshot below. In Internet Explorer, go to the View menu, select 'Explorer Bars' menu item, and the 'Favorites' to display the favorites bar. In Opera go into the Settings menu, then select 'Toolbars' menu icon and then the 'Bookmarks Bar' to show the favorites bar which is hidden by default. When navigating around the web, if you decide to save a page to the favorites collection you have with www.linqto.me, just press the Linqto Bookmarklet button on your browser. It will open a new window with the url of the page you wish to save already populated. You may choose to add more information on the bookmark, such as keywords or a description, or just press the 'Save' button directly and let the system generate the information from the page directly. And you have saved your bookmark into the Cloud. 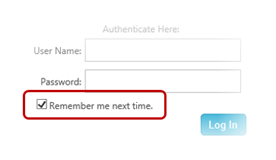 Remember to also tick the 'Remember me' check box when logging on to www.linqto.me before attempting to use the bookmarklet, as this will allow the system to authenticate you when you attempt bookmark a page. Continue reading part 2 to see how to use the 'Internet Explorer Accelerator'. 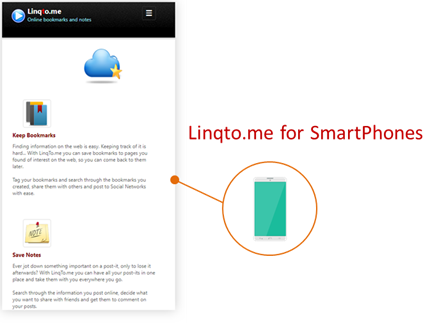 If you want to start using www.linqto.me to manage your bookmarks online, you might want to transfer your already existing browser bookmarks into the Cloud to continue using them and add more as you go along. The process to import existing favorites from a browser into Linqto.me is a simple three stage process and can be done in just a few clicks. The system will allow you to upload the HTML file generated by your browser and will then indicate how many favorites were contained inside the file once it has examined in. While a favorite bookmark in a browser only has a title and the URL of the site it is pointing to, in www.linqto.me a bookmark allows you to have more information added to it. Notably, a bookmark allows you to add keywords to it so that you may search for it in the system afterwards. It also allows you to have a description text, where you can take notes about the page the bookmark is pointing to, for example. Bookmarks also allow for a thumbnail image to be associated with them – this image is retrieved from the page the bookmark is pointing to. During this stage, www.linqto.me will go through the list of bookmarks you are trying to import, and will scan each one. It will attempt to connect to the site the bookmark is pointing to in order to generate a description, extract keywords and associate a thumbnail. This process does require some work (on behalf of the system) but a progress bar will inform you of how many bookmarks have been scanned and how many are still remaining. Please do not navigate away from this page while the scanning process is in progress, as this will stop the import procedure. Once the system has finished scanning each of the bookmarks you wish to import into the Cloud, it will present you with a list of bookmarks with keywords, description and thumbnails already filled in. You can click on the magnifier lens in front of each of the bookmarks to go in and see the details for a given one. When you are on the bookmarks details view can also modify the information the system has generated for a given favorite if you wish. Once you are back on the list of inspected favorites, you can the press the 'Import All' button to save all the favorites that have been extracted from the HTML file you have provided into www.linqto.me. If you have made any changes to the way the system has generated description, keywords or thumbnails for a favorite or favorites, these changes will also be saved into the system. When the save is completed, you will be taken to your 'Bookmarks' page where you will be able to see all the favorites you have imported. You might then want to look into sorting these favorite bookmarks using folders, as explained in this article. 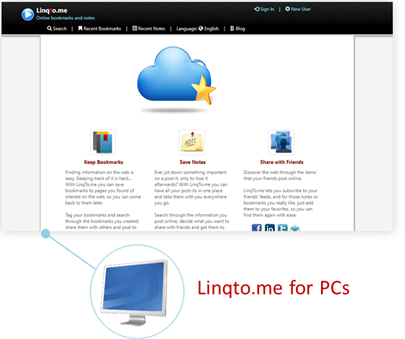 You can also configure you Start Page on www.linqto.me as explained here. With the introduction of version 7.0 of www.linqto.me the system offers you a new dashboard to quickly view the bookmarks you have created / imported into the cloud. Once you get to the authenticated user landing page (here) you will see a new icon is available to take you to the bookmarks Dashboard. If you visit one of the bookmarks you have created on www.linqto.me in your browser and you are already logged into the system, the system will remember that you have visited that bookmark. If you chose the recently visited view in the dashboard configuration, the dashboard will display a list of all the bookmarks you have visited (while logged on). The list will be sorted from starting from the most recently visited bookmark. This is another rendering of the classic view that you have of all of the bookmarks that you have in www.linqto.me, sorted in inverse order of their creation - the bookmark you have created last (or modified last) will be the first to be displayed in this view. In this view, you can also choose to configure the sorting criteria further. You can choose to sort the bookmarks you have with your account either by name, creation date, last update or number of views. You can opt for ascending or descending order of the sort to be displayed in the dashboard. 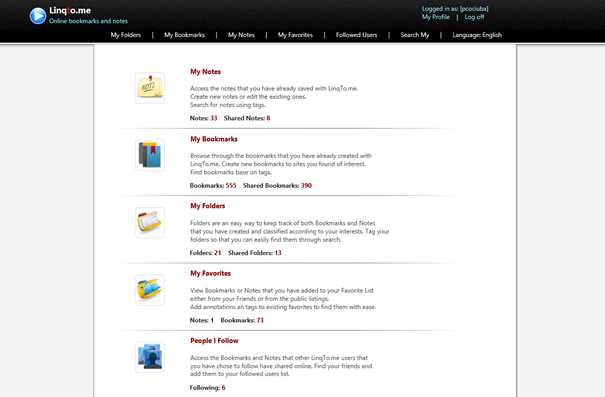 In this view, the Dashboard will display all bookmarks coming from a folder you have already created with www.linqto.me. For more information on how to manage folders in the system you can refer to a previous article in this blog, article you can find here. You can also configure the new Dashboard to be the default landing page when you visit www.linqto.me and you are already logged in. If you wish to see how to configure this, you can read the following article. By making the dashboard your landing page you can immediately access the bookmarks view that suits you best. In the recent articles, we have looked at how you can import favorites into the Cloud and how you could use keywords to allow you to find saved favorites via searches with ease. You can also categorize your favorites in the cloud with www.linqto.me by placing them into folders. After you have logged in to www.linqto.me, go to the My Folders page, either from the User home page, or by clicking on the My Folders link on the top left hand side of the navigation bar. To create a new folder in www.linqto.me, it is very easy, just click on the 'Create New Folder' button that is at the top of the list of available folders in the 'My Folders' page of the system. 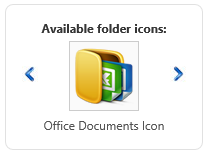 Each folder you create must be given a name and will have an icon associated with it. To change the icon that will be displayed next to the folder click on the and buttons to cycle through the available icons and pick the one that you think best suites the new folder you are creating. You can also provide a description for the folder you are creating in such a way as to have a little bit more information available as to the contents of the favorites you intend to store inside the folder. As in the case of favorites and post-its that you create with www.linqto.me, you can also associate keywords with folders. Using keyword will allow you to search for folders and easily locate them by keyword once your collection of folders grows. Once the folder is created, you have two quick ways in which you can add content to that folder. Starting from the folder: The first way to add content is to press the 'Add Folder Content' button which is located on the upper side of the Folder Details page, next to the buttons that allow editing or creating new folders. When you click on this button the site will redirect you to the list of all your favorites present in the system. You will note that in this list, next to the button which allows you to see the details of a given favorite ( ), you will also find a button ( ) that will allow you to add the favorite to the folder. By pressing the ( ) button, you can add several favorites to the same folder very quickly. 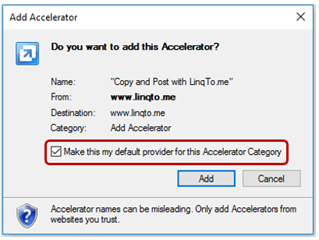 You can also use the 'Search My' page, after having clicked on the 'Add Folder Content' button, to do a keyword search for specific favorites you have saved with www.linqto.me. In the search results listings page, you will see the same ( ) button allowing you to add favorites from the search results to the folder. During the add operation, you will see that a small window will appear on the bottom of the www.linqto.me pages – this window will list the name and icon of the folder that you are adding favorites to, as well as how many favorites are already in that folder. Once you have finished adding all of the needed favorites to your folder, you can click on the button located on the top right hand corner of the window, and you will be returned to the Folder Details page, where you will also be able to see a listing of all of the favorites that are now in the folder. Starting from an existing favorite: a second method of adding a favorite to a folder in www.linqto.me is to go to the page listing the details of that favorite into the system (click on the M button next to a favorite). On the right hand side of the favorite details page, you will see the 'Folder' settings area with a button that will allow you to change the folder the favorite is in, or add the favorite to a folder. Click on the 'Change' button in order to have the list of all of the folders that are available with your www.linqto.me account and chose a new folder for your favorite. Click on one of the folders from the listing and the favorite will automatically be added to this new folder. It is important to note that a given favorite can only be in one folder at a time. If you change the folder of a favorite from Folder A to Folder B, the favorite will be placed in folder B and no longer be among the favorites found in folder A. In the same way, you can use folders to also sort and manage Post-its you have in your www.linqto.me account. You can use either of the two methods described above to add a Post-It to a folder. A folder can contain both Post-Its and favorites at the same time. Happy sorting of content using folders in the Cloud with www.linqto.me!